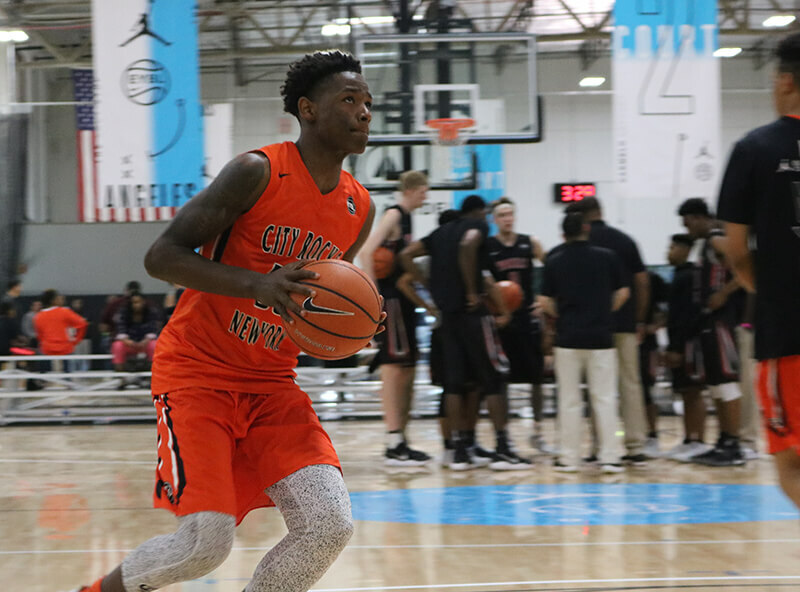 THOUSAND OAKS, Calif. – 6-foot-6 small forward Nahziah Carter turned quite a few heads at the Nike EYBL Circuit last weekend. Ranked outside the top 300 of the class of 2017 by 247Sports, Carter has seen his profile rise considerably in recent months. Carter played a central role in leading New York City Rocks to a 10-6 record on the EYBL Circuit and a spot at the Peach Jam this summer. In 16 games, Carter averaged 12.7 points, 4 rebounds and 1.7 assists on 58 percent shooting. The Rochester, New York, native wowed crowds at session four of the EYBL with chase-down blocks and posterizing dunks. But Carter also made many plays that although were just as important for his team, went without much fanfare. Carter had a habit of setting well-timed screens for teammates, taking charges and making the right pass in traffic. Although currently on track to enroll in college this fall, Carter has discussed the possibility of heading to prep school and reclassifying to 2018. Carter committed to Dayton back in November, but de-committed in April following the departure of coach Archie Miller. Last week, Indiana offered Carter a scholarship for 2018. “I really like (Archie Miller). I like his coaching style, the way he gets on the players, his relationship with the players and their families, too. I believe he’s a great coach. 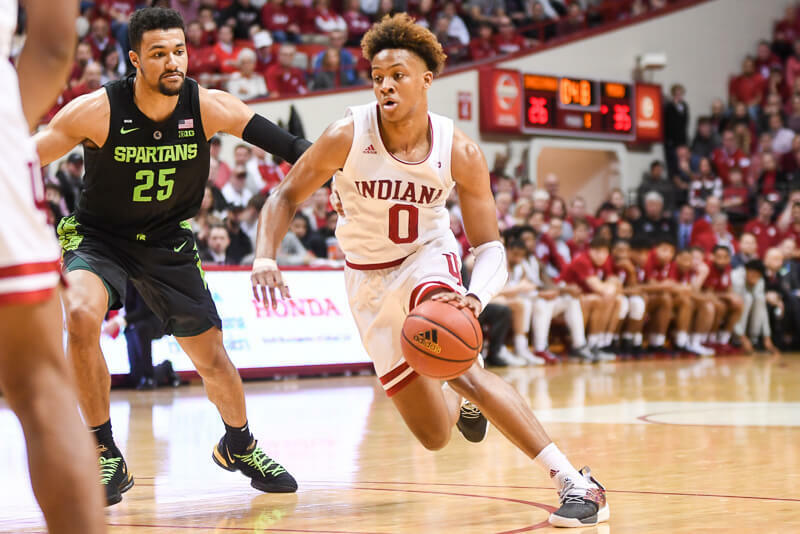 With the departures of James Blackmon Jr., Thomas Bryant, OG Anunoby and Grant Gelon, the Hoosiers now find themselves with an open scholarship. Carter has yet to be offered by Indiana for 2017. Besides Indiana, Carter says he’s been in the most contact with Georgetown, Washington, Georgia Tech, UMass and Boston College. Carter is also the nephew of rapper and media mogul Jay-Z, who made a surprise appearance at Carter’s afternoon game on Saturday. Seems to play bigger than 6’6 and he is intense. I’d like to have someone like him at IU whenever he’s ready. If he was going to go to prep school he might as well commit now and redhsirt next year if IU is his plan. Energy is a talent all to its own, and this kid has it (well, based off one highlight reel…). Great timing, too. And while he looks a bit lean, he seems to have a knack for playing in traffic, which is clearly something that CM looks for in his players. Don’t care what the rankings say, I’d take him in a heartbeat. Man, you can just feel a more solid and coherent team coming. I won’t make any predictions about wins and losses, but I am 100% certain that we will be more satisfying to watch than we have been in a long time. And as CM get his players in here over the next couple of years and builds the program and culture to meet his approach, I think the wins will come. Agree, we’ve learned about rankings through Victor, Will, and OG. If Archie and Nahziah have a connection why not let them work together here at IU versus. Keeps his head up while he’s handling the ball – sees teammates well. Has a nose for the ball – one of those guys who seems to turn up where the ball ends up. Good touch around the basket. What’s not to like? Agreed, Arch. I’ve been thinking this next couple of teams will be more “how the hell did we win that game with THOSE players” instead of the “how the hell did we lose that game with THOSE players” we’ve been used to. I’m undecided on this guy’s game and whether he is IU material. 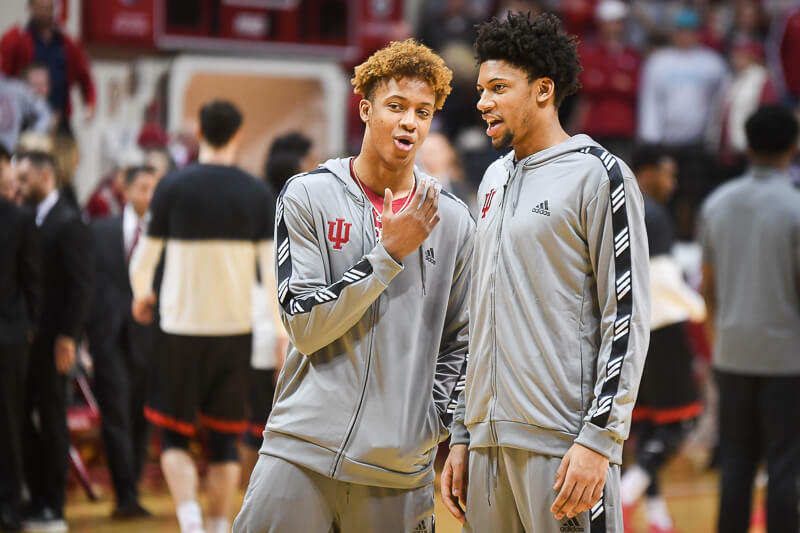 That said, the prospect of Jay-Z wearing IU gear and coming to an IU game is pretty cool, and would be great for recruiting. Exactly what I was thinking. But it might be Archie has someone else he is working on for 2017. Stashing a kid like this in prep school for a year is pretty strong. Beyoncé and Jay Z sitting right next to Mellencamp his latest squeeze and Lawguy in the good seats. I love his tenacity on the court. But, what needs more attention here is that this is a smart player. He has great court vision both defensively and offensively. I won’t rehash the past, but seeing a premium put on basketball IQ with athleticism vs looking for guys “if they can put it all together” is a lot easier to root for. I like his defense first mindset. And he finishes above the rim and appeared to be a great slasher. I still think coming in 2018 would be a better choice on both sides. He has a much better chance when Hartman and McFly both graduate next year. With the open scholly, ideally we need a graduate transfer who can play the 4 or 5 with immediate playing time. 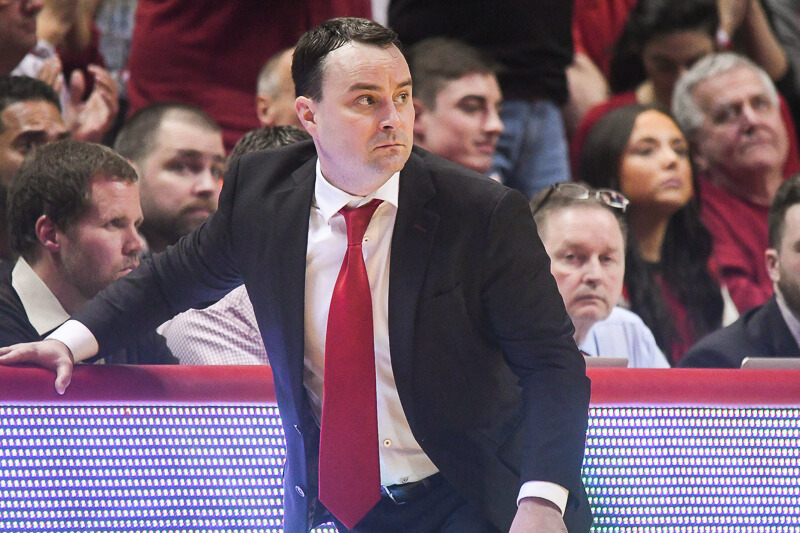 Having Jay-Z to produce an Indiana song for the new Archie Miller era certainly sounds enticing. Prep school allows him to play in games, Red shirting does not !!! Will not happen !!! I like his tenacity but I wonder if he is a bit small for the Big. If he is 6’6″ he seems more comfortable playing around the basket. I am not sure that translates at this level. I believe we will see him in an IU uniform. Whether that is this year or next is hard to say. I’m guessing his talk with Archie will be … come this year and have limited minutes or prep school a year and you’ll likely be a solid rotation guy next year. I don’t know everything about I.U. basketball but I.U. doesn’t have a player named mcfly. Shades of TW. Not the same player, of course, but quite a play. He could be the key to get Romeo! If he knew he’d get to meet and hangout with Jay-Z and Beyonce!